How Do I Choose the Best Cropped Blazer? Cropped blazers are shorter in length than traditional blazers. A cropped blazer can make a nice addition to any wardrobe. Choosing the best one is largely a matter of personal taste although color, style, fit, and fabric should all be evaluated before a purchase is made. 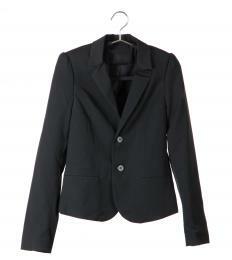 Thinking about each of these elements will help you to find the best cropped blazer. Generally, a cropped blazer is shorter in length than a traditional blazer. The length can vary, but it usually falls somewhere between the waist and the just underneath the bust line. Choosing the right length is a combination of deciding which length best flatters your body type and your personal preference. Sleeve lengths also vary from one blazer to another with some options being short sleeves, three-quarter length sleeves, and full length sleeves. The right sleeve length depends upon the type of clothing with which you will wear the jacket, the occasions on which you will wear the jacket, and the type of sleeves you are most comfortable wearing. While shopping for a cropped blazer, you may find that there are several different cuts to choose from. Some styles of blazer are straight cut with blunt, squared edges. Others have rounded edges that create a softer look. Cropped blazers can also have a notched cut, in which the cut of the fabric begins at the button of the blazer and is angled toward the back. Each style of blazer has a distinctive appearance and will look different on each person and body type, so choose the one that best flatters your shape. Fit is an important consideration in choosing a cropped blazer. You may want to try on several different styles, lengths, and cuts to find the one fits you best and is the most flattering. A poorly fitting blazer will not only be uncomfortable, it will not look as good as one that fits well. Cropped blazers can be made of wool, cotton, rayon, or polyester as well as different blends. Think about where you will be wearing your blazer most often when choosing a material. A heavy material like wool will make a nice outdoor jacket but might be too warm to wear in an office. The fabric used for most blazers is not machine washable and must be dry cleaned. Consider which color will make the best addition to your wardrobe. Cropped blazers are available in neutral, solid colors, such as navy, brown, and black as well as bright and bold solids like red, pink, and green. A neutral color might be the best option so that you can wear the blazer with a variety of outfits. Patterns, such as pinstripes and animal prints, can be worn with some items, like a solid colored dress. Different styles of cropped blazers have different accents. Pockets, lapels, and buttons are all accents that are available on some jackets but not others. Pick a blazer that is functional and that appeals to your sense of personal style. How Do I Choose the Correct Blazer Size?